The new ‘What is autism?’ film is narrated by Alan Gardner, the star of Channel 4’s hit show, ‘the Autistic Gardener’. It explains what autism is, autistic people’s strengths and the challenges they can face too. The National Autistic Society has also developed another animation for young children called the ‘Trummies’ which is part of a series of free learning resources the charity has developed for primary and secondary schools. The resource pack also includes lesson plans, a quiz from ‘I’m a Celebrity’ star Anne Hegerty and assembly ideas. Over 3,000 teachers have signed their schools up to take part so far. Activities are taking place across the country to mark World Autism Awareness Week. Over 3,000 teachers have signed their schools up to receive free educational resources to help children and young people learn more about autism. The National Autistic Society is also holding an inquiry session with the All Party Parliamentary Group on Autism to consider what more can be done to increase public understanding of autism. "World Autism Awareness Week is a unique time for everyone to learn more about autism – whether it’s the general public, teachers or politicians. "Almost everyone has heard of autism now. But we continue to hear from autistic people and their families who miss out on an education, struggle to find work or become extremely isolated – often due to misunderstandings about autism and what’s it’s like to be autistic. "Better understanding of autism could transform the lives of hundreds of thousands of autistic people. 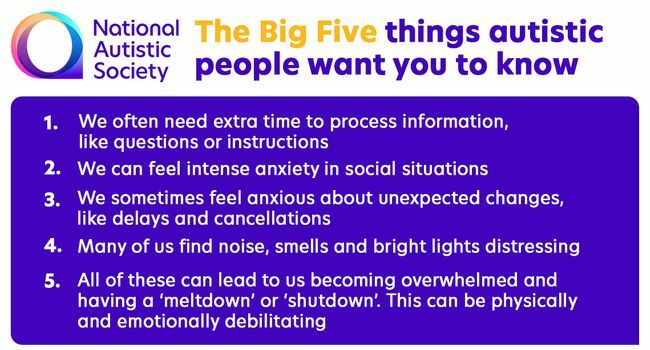 We encourage everyone to visit our website, watch our new film and learn about the ‘Big Five Things’ autistic people and families tell us they want the public to understand."